And the Prosecutor who held their fate in his hands. Joshua Penbrook had lost at love, plain and simple. With that loss still fresh in his mind, he wasn’t any too eager to try his hand at it again any time soon. If Love was going to find him, it could bloody well do so behind his closed office door. It would be hard, yes, but that was Love’s problem. Not his. Willard Drake had never wanted to be an attorney. But as the last of a long line of legal Drakes, his father hadn’t given him much of a choice. Trust his father to put the fate of a falsely accused transgender woman into the hands of a rookie lawyer. After all, it was a case the Senior Drake really didn’t care if they lost. But Willard did. He cared a lot. Could Justice prevail for his innocent client? And was Love truly up to the task at hand? If it hadn’t been for the handsome stranger stepping in, he might not have made it out of that bar. Unfortunately, just making it home wasn’t the end. Now the psycho from the bar was stalking him. The bad news was he had no proof, or witnesses, to back him up. 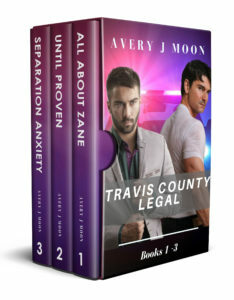 Each book in the Travis County Legal Box Set is a slow burn MM Gay Romantic Mystery with a Happily Every After and no Cliffhangers.